Coronary angiography has an important role in invasive imaging of the coronary arteries. However, it has got limitations in the determination of physiologic significance of individual artery lesions. Coronary pressure derived FFR can be used to rapidly assess the hemodynamic significance of individual coronary artery lesions and can be easily performed in catheterization laboratory. FFR has been shown to effectively help coronary revascularization procedures with improved patient outcomes. FFR is a very important tool for determination of functional significance of coronary stenosis. It combines physiological and anatomical information which can be immediately followed by percutaneous coronary intervention (PCI) if required. 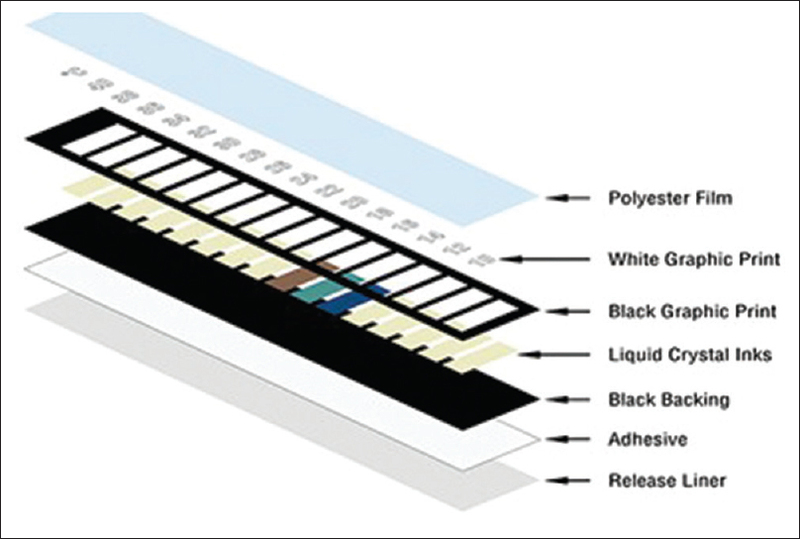 The technique for FFR measurement is easy, safe and can be rapidly performed in the catheterization laboratory. PCI can be made more effective by proper and systemic use of FFR in dubious situations. The current clinical evidence for FFR is very encouraging for cardiologist to use this tool in the catheterization laboratory as and when required. Thermology is the study and application of bio-thermal process to assess health or disease while thermography is a technique of measurement of skin temperature distribution on the body over a given period of time. It is a noncontact, noninvasive method that utilizes the heat from an object to detect, display, and record thermal patterns and temperature across the surface of the object and it employs images and visually evaluates the thermal changes. The principle of thermography is based on the amount of blood circulation at different layers of the skin, as it varies, the temperature also changes accordingly. Consequently, disorders that affect the blood flow too result in abnormalities in temperature distribution and these when evaluated will provide valid diagnostic information. Thermography is being used to detect various pathological conditions in the medical and dental field. Various orofacial conditions in which thermography can be used are chronic orofacial pain, temporomandibular joint disorders, quantification of thermal insult to pulp, assessing inferior alveolar nerve deficit, and detection of herpes labialis in prodromal phase. Here, we discuss with the history, basics, and various applications of thermography in dentistry. Introduction: Lichtenstein technique is an age-old accepted technique of inguinal hernia repair. However, we have compared it with laparoscopic totally extraperitoneal hernia repair in terms of clinical outcome, quality of life, safety, and effectiveness. Materials and Methods: One-hundred and fifty patients were randomized to TEP group (75 patients – Group 1) or Lichtenstein repair group (75 patients – Group 2); pre-, peri-, and post-operative factors were then recorded. Results: Preoperative factors were similar in both the groups. Chronic pain was more prevalent in Lichtenstein repair than TEP group. Recurrence rates were similar in both the groups. Patients in laparoscopic group returned to work much earlier than open group resulting in more economic savings and decrease in loss of working days. TEP was a expensive procedure.Conclusions: The laparoscopic technique with mesh in the treatment of inguinal hernia in our rural setup is still complimentary to open mesh repair and not an alternative, irrespective of several important clinical aspects, with concomitant improvement in patient satisfaction in terms of early return to work. Background: The aim of the study was to estimate the prevalence of obesity, overweight, and thinness and compare it using different growth standards among schoolchildren and adolescents. Material and Methods: Anthropometric measurements of all students of four schools from 3rd to 12th standards were taken. Prevalence of overweight, obesity, and thinness was measured and compared using four standards – Agarwal 2001 standards, revised Indian Association of Paediatrics (IAP) 2015, World Health Organization (WHO) 2007, and International Obesity Task Force (IOTF) standards. Results: A total of 1496 children including 79.1% boys and 20.9% girls participated. Prevalence of obesity was reported 9.1% by Agarwal standards, 14% by IAP standards, 11.1% by WHO standards, and 5.1% by IOTF standards. Overweight children prevalence was reported more (19.1%) with IAP standards, followed by 17% with Agarwal standards, 15.8% with IOTF standards, and 15.3% by WHO standards. Prevalence of obesity and overweight was high among boys than girls in all three standards. A good level of agreement found among IAP 2015 standards with Agarwal and WHO 2007 standards considering four categories. The agreement was improved further up to 0.90 when compared to two combined categories – overweight/obese versus normal weight/thinness. Conclusion: High prevalence of obesity and overweight was reported with IAP 2015, Agarwal, and WHO 2007 standards in the age group of 8–18 years. Good agreement was found for revised IAP 2015 with Agarwal and WHO 2007 standards for measuring obesity and overweight. There was an underestimation of obesity with IOTF standards. Squamozygomatic mastoiditis is a rare and atypical presentation of acute mastoiditis, presenting as a swelling in front of the ear, with only a few reports in the literature. In contrast to the classic manifestation of acute mastoiditis, atypical form of squamous-zygomatic mastoiditis; the inflammatory process spreads to the zygomatic apophysis and infection reaches the squamous portion of temporal bone and makes a fistula between this portion and the temporal muscle, shifting the pinna of the ear downward. Otorhinolaryngologists must know and remember the possibility of having atypical mastoiditis, and a clinical history, physical examination, mastoid computed tomography scan, and high index of suspicion is important to make a diagnosis of this atypical form of mastoiditis. Skin tuberculosis (TB) is a relatively uncommon form of extrapulmonary TB. Even in the countries with high pulmonary TB loads, cutaneous TB (CTB) cases are rarely reported. 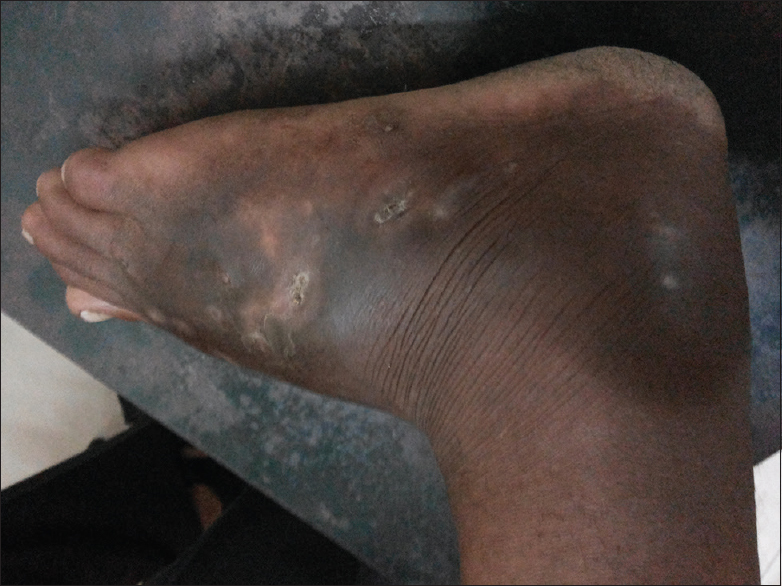 Here, we report a case of 35-year-old male who presented with diffuse swelling and multiple discharging sinuses over the right foot for 7 years nonresponding to any kind of treatment which was confused with mycetoma but the etiology came out to be tubercular on further workup leading to the diagnosis of CTB. This case highlights the importance of suspecting CTB particularly in a geographical area where TB in every form is very much predominant. Schilder's myelinoclastic diffuse sclerosis is a rare sporadic demyelinating disease that usually affects children between 5 and 14 years old. 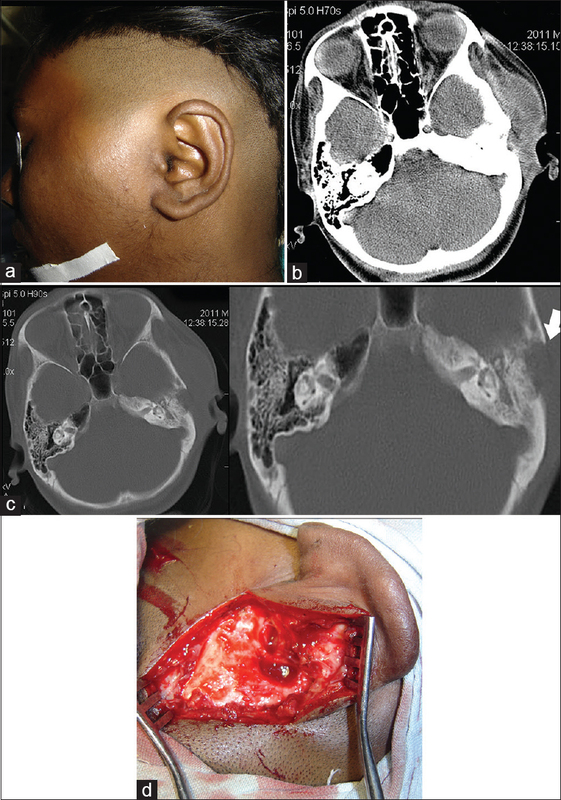 The disease often mimics intracranial neoplasm or abscess. We report a 9-year-old girl with Schilder's disease who presented with sudden onset of right hemiparesis. Brain magnetic resonance imaging (MRI) showed a single large tumefactive white matter lesion. A diagnosis of Schilder's disease was based on clinical features and MRI findings. The patient showed dramatic clinical improvement and significant regression of the lesion in response to high-dose intravenous methyl prednisolone. Double pituitary adenomas are rare, and they account only 1%–4% of all pituitary adenomas. Single or multiple adrenocorticotropic hormone (ACTH) producing adenomas are rare; even small adenomas can produce potent endocrinological effects. So far only two case reports mentioning monohormonal ACTH-secreting double adenoma have been reported. Higher resolution magnetic resonance imaging and postcontrast thin T1 spoiled gradient acquisitions can improve detection of these tumors. Surgery should be done with caution, sella should be explored meticulously to assure complete resection of all tumors as many studies have earlier documented high recurrence rates with ACTH adenomas. 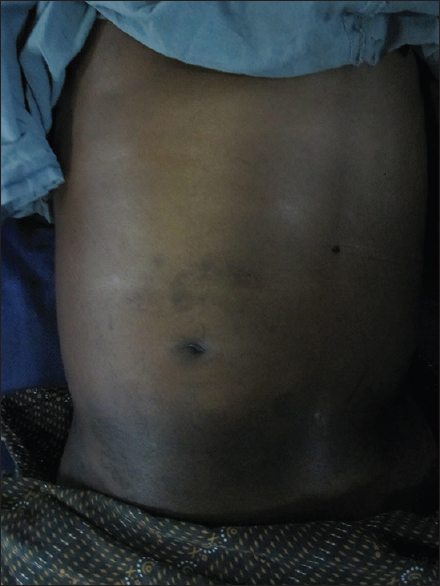 Mesenteric dermoid cysts are one of the most rare intra-abdominal tumors. Till date, very few cases of dermoid cysts of mesentery have been reported in adults. Due to imprecise clinical features and very low incidence, these cysts may present a diagnostic and therapeutic challenge. 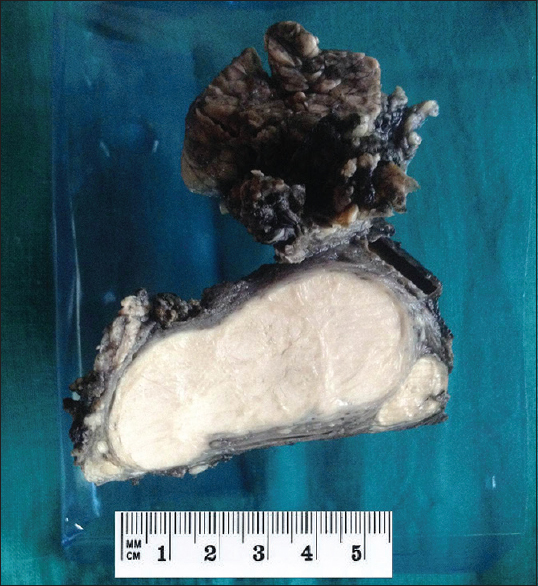 We present a rare case of mesenteric dermoid cyst along with protozoal colitis in a 50-year-old female. Omental infarction is a rare cause of acute abdomen in adult. Omental infarction is classified as primary when there is no coexisting causative condition identified or secondary when there is an association with causative condition. Omental infarction is more common in male compared to female and frequently occurs in the fourth or fifth decade of life. This is a case report of a 45-year-old male who is chronic alcoholic, presented with features of hollow viscus perforation. Intraoperative findings show secondary omental infarction due to duodenal perforation. Omental infarction is a rare complication due to duodenal perforation. Primary lymphoepithelial carcinoma (LEC) of salivary gland is very rare and accounts for 0.4% of all malignant salivary gland tumors. LEC occurs more commonly in parotid. It is endemic in certain regions of world and has a racial predilection for Eskimos, Southeastern Chinese, and Japanese. Incidence is slightly more in females. We herewith report a case of LEC of the parotid gland in a 54-year-old male from a nonendemic area (Central Kerala, India). Hypertriglyceridemia is less frequent cause of acute pancreatitis. Serum triglyceride level of >1000–2000 mg/dl is identifiable risk factor. It presents as an episode of acute pancreatitis or recurrent acute pancreatitis. The mainstay of treatment includes restriction of fatty meal and starting with fibric acid derivatives. We report a case of 24-year-old female presenting with the second episode of acute pancreatitis. Her genetic analysis revealed the following mutations: lipoprotein lipase, transducin (beta)-like 2, apolipoprotein A-V, angiopoietin-like 3, and tribbles homolog 1. Context: Tuberculosis is one of the most important public health problems in India with 2.2 million incident cases, which is about 25% of global incidence. 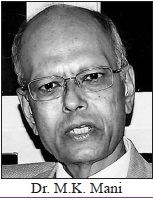 World Health Organization (WHO) includes India in high tuberculosis burden countries. Along with conventional indicators, magnitude of treatment delay may prove as a performance indicator for tuberculosis control in high tuberculosis burden countries like India. Aims: 1. To find out the magnitude of delay and factors responsible for delay in initiating the treatment for tuberculosis. 2. To assess the knowledge of patients in rural area about Tuberculosis and DOTS (Directly Observed Treatment Short course). Settings and Design: Cross-sectional study conducted among patients registered in the DOTS centre at Mahatma Gandhi Institute of Medical Sciences (MGIMS) Sewagram. Materials and Methods: Information of all 40 new sputum smear positive tuberculosis patients registered at DOTS centre between February to April 2015 was collected. Of these, 30 patients could be contacted successfully and were included in the study after obtaining consent. Data was collected telephonically by interviewing the patients using study questionnaire. Statistical Analysis Used: Data was entered in Microsoft Excel and analyzed using Epi Info. Descriptive analysis using frequency and percentage was carried out to assess the knowledge regarding Tuberculosis and DOTS. Results: Median total delay was 35.5 days with diagnostic delay comprising 84% of it. Males (OR = 3), patients belonging to Above Poverty Line (APL) families (OR = 5.5) had higher Odds. However these were not statistically significant. Conclusions: Diagnostic delay (the time interval between the first consultation with a healthcare provider and final diagnosis) forms a major part of total delay (defined as time interval from the onset of symptoms until treatment initiation). Context: Formidable disability burden associated with human lymphatic filariasis has compelled WHO to campaign for its global elimination programme. Diethyl-carbamazine (DEC) is the mainstay for mass drug administration strategy under this programme. However, till date proper rationale of this almost solitary drug is unknown. Moreover, it has no direct action on the parasite. These limitations call for the search of novel therapeutic options. Cardinal importance in cellular proliferation due to direct involvement in DNA synthesis made folate metabolism, a lucrative therapeutic target. Polyphenols might be a feasible candidate for inhibition of key enzyme of folate metabolism, dihydrofolate reductase (DHFR), since it shares common origin with folate from shikimate pathway. Chalcones are one significant subset of such polyphenols. With this perspective, our research question was that whether synthetic chalcone derivatives can be used as probable antifilarial agent against Brugia malayi by targeting parasitic folate pathway. Aims: 1. To validate possible effect of certain chalcone derivatives against B. malayi microfilariae and its therapeutic safety against peripheral blood mononuclear cell (PBMCs). 2. To explore the apoptotic activity of the proposed compounds by AO-EB staining. 3. To validate B. malayi DHFR enzyme as a plausible target of the drug by both in vivo and in silico studies. Setting: Filarial parasitic model in vitro study. Design: Basic experimental study design. 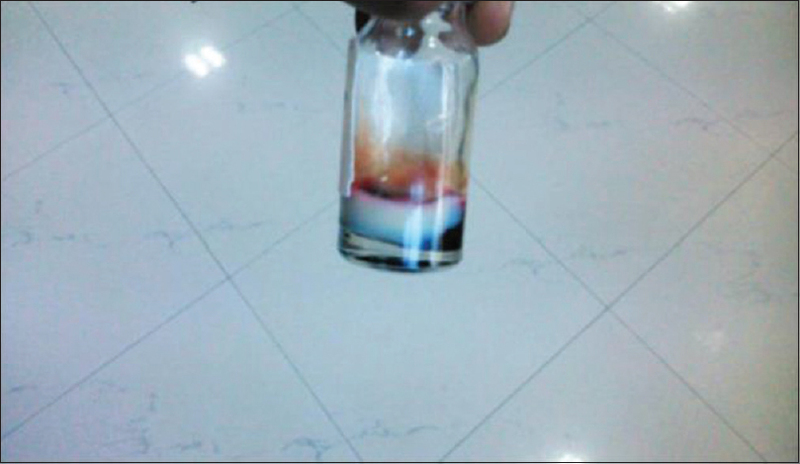 Methods: A series of chalcone compounds was synthesized, characterized and then screened against microfilariae of B. malayi to test their therapeutic potential in terms of loss of parasitic motility. Further, best selected compound was used for determination of inhibitory concentration required and also for the possible lethal dose against human PBMCs. Both in silico molecular docking and further in vitro folate reversal studies were carried out to validate the parasitic target. Possible induction of apoptosis was tested by MTT and cytoplasmic cytochrome c ELISA assay with the proposed drug treated parasite along with suitable controls. Statistical Analysis: Suitable statistical methods for comparative analysis were used. Results: Among 17 chalcone derivatives, M1R showed marked antifilarial effect in micro-molar dosage; also wide difference between IC50and LD50ensured therapeutic safety. Molecular docking through bioinformatics approach with the proposed drug against pre-validated DHFR protein structure of B. malayi showed favourable thermodynamic parameters with lower inhibition constant as compared to positive control. Significant reversal of antifilarial effect of drug mediated DHFR inhibition by addition of folate indicated plausible mechanism of competitive inhibition. Further, significant apoptosis recorded by MTT assay and cytoplasmic cytochrome c ELISA in drug treated parasite against untreated control confirmed a presumable outcome of inhibition of folate metabolism by M1R compound. Conclusion: These results lead us to propose that filarial folate metabolism can be targeted through DHFR with consequent induction of apoptosis for effective therapeutic intervention, using a rationale of structural analogy based competitive inhibition of DHFR by chalcone derivatives. Context: Globally around 1/2 of all under 5 deaths are attributable to undernutrition. The magnitude of child under-nutrition in India is one of the highest in world. Responsive feeding that has the potential to optimize nutrition and development depend's on a “healthy mother”. Aims: To find out the magnitude and determinants of maternal depression in rural mothers and study it's association with infant feeding practices and nutritional status of infants. Settings and Design: Hospital based observational cross sectional study. Materials and Methods: Study was conducted among consecutively chosen 300 mothers and their infants who visited the immunization clinic of hospital during May to September 2016. Data was collected individually by interviewing each mother and anthropometry of her infant was done. The mothers with probable depression were diagnosed according to the 10 item Edinburgh Post-natal Depression Scale (EPDS). Statistical Analysis Used: Magnitude of depression is reported using frequency and percentage while probable association have been studied using Odds ratio with 95% Confidence interval and Student's 't' test at 0.05 significance level. Results: The magnitude of maternal depression was 19%. Maternal depression had significantly higher Odds for not indulging in responsive feeding. Maternal education and education of husband had significant association with maternal depression. Conclusions: Burden of maternal depression is high among rural mothers and is significantly associated with non-responsive feeding practices that may be responsible for poor nutritional status of infants. Context: Thyroid disorders are amongst the most common endocrine diseases in India. One in every eight women during their life time has a risk for thyroid disorder. There is however a paucity of data from therural areas. There is still a lack of information on thyroiddysfunction amongst people in Wardha district. Aim: This study aims to elucidate any specific pattern of distribution of the general clinico-epidemiological variables recorded in the women patients advised for thyroid profile assessment and to find the associative lipid profile marker(s). Settings and Design: Hospital based secondary data analysis study on the records of female patients. Materials and Methods: Data analysis on the records of female patients 20–55 years of age was retrieved from Hospital Information System (HIS) for whom thyroid and lipid profile investigations were performed. Statistical Analysis Used: Descriptive statistical procedure was carried for various categories using Epi Info 7 software. Results: We found that the highest proportion of patients fall under the category of hypothyroidism. A completely new trend that we observed in this study was significant correlation of triglyceride (TG) with thyroid stimulating hormone (TSH), T3 and T4 in thyroid disorders. Thyroid stimulating hormone (TSH) shows significant association with increased triglycerides and increased VLDL levels. Conclusions: Hypothyroidism occurs most frequently in women entering menopause, which typically occurs in their late 40 s and early 50 s. Thyroid dysfunction can have an effect on lipid profile which can directly cause cardiac abnormalities. Context: Medical students experience significant stress during various levels of their course. This stress and anxiety develop early in medical training and may increase over a period of time and may eventually lead to stress induced disorders and deteriorating performance. An innovative attempt was explored by introducing yoga as part of life in M.B.B.S. students in order to determine the benefit if any of yoga in combating with the stress and anxiety. Aim: The aim of this study was to find out the short-term impact of yoga intervention on the stress experienced by medical students. Settings and Design: The study was carried out in the Department of Physiology of MGIMS, in collaboration with Arogyadham (Health care and research project of Kasturba Health Society, Sevagram). It was an Interventional study with Pre and post design. Materials and Methods: 50 MBBS students of Mahatma Gandhi Institute of Medical Sciences, Sevagram, Wardha were included in the study within the age group of 17-25 years. Spillberger's anxiety scale was used to determine the anxiety score of students. It was determined on two occasions; before and after the practice. Statistical Analysis Used: Data was collected, tabulated and statistical analysis was done using statistical software and paired t-test was applied to compare the mean scores before and after intervention. 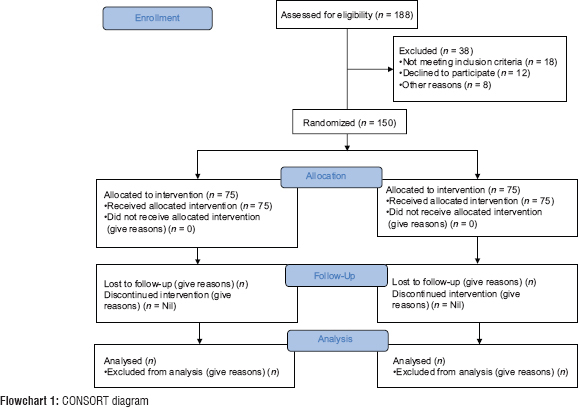 Results: Anxiety status showed a statistically significant reduction following yoga practice using paired t-test for analyzing pre and post intervention scores. The mean ± SD anxiety score was 93.8 ± 8.2 before yoga practice and it reduced to 65.62 ± 7.5. 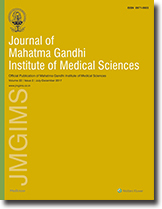 Conclusions: The results point to the beneficial role of yoga in not only causing reduction in basal anxiety level but also enhancement in parameters like better sense of well-being, feeling of relaxation, improved concentration, self-confidence, improved efficiency, good interpersonal relationship, increased attentiveness, lowered irritability levels and an optimistic outlook in life. Context: Anthropometric measurements are used eventually for various medical researches. Anthropometry is a science which is the study of size and shape of biological components and their variations in populations. Studies on craniofacial anthropometry have allowed for identification and quantification of syndromic clinical features, planning for treatment, monitoring of operative outcomes and sometimes assessment of longitudinal change. Considering Anthropometry can be important tool in early suggestion of diseases, an attempt was made to study facial Anthropometry in healthy individuals and hypertensive subjects. Aims: The aim of the study was to compare the Anthropometric Measurements in patients of hypertension and healthy control subjects. Settings and Design: The study was conducted in the Anthropometry section of Department of Anatomy, Mahatma Gandhi Institute of Medical Sciences (MGIMS) in collaboration with Department of Medicine of the same institute. It was a cross-sectional, Observational study design incorporating a total of 100 subjects. Materials and Methods: Out of 100, fifty were healthy controls and fifty patients in the age range of 35-50 years diagnosed to have hypertension from Sevagram village. The instruments used for study are Stadiometer, Digital weighing balance, Spreading Calliper, Vernier calliper and measuring tape and sphygmomanometer for measuring Blood Pressure. The various measurements were made pertaining to facial anthropometry and on the basis of the findings, the indices calculated are Physiognomic Facial Index, Morphological Facial Index, Mandible Width-Face Height Index, Sagittal Naso-Facial Index, Mandible-Face Width Index, Chervind's Transverse Cephalo-Facial Index. Statistical Analysis Used: We employed Chi-square test for comparison of indices evaluated. Results: The indices thus obtained are compared for males and females separately. Most of the indices are non-significant except Mandible-Face Width Index in females and Physiognomic Facial Index and Morphological Facial Index in males. Conclusions: Though the data analysis have not concluded any change in facial anthropometry in hypertensive subjects with affirmation but the data obtained for control subjects in Central Indian Population can further be utilised by Anthropometrics, Forensic Experts, Anatomists and Plastic surgeons too. Background: Sleep quality affects the academic performance and interpersonal relationships of students and predisposes them to mental illnesses. Personality traits are one of the known factors contributing towards the sleep architecture of an individual. The present study investigated the relationship between sleep quality and personality traits among medical students. Aim: To study the various personality traits among the medical students and its association with sleep patterns. Settings and Design: The index study was a cross-sectional, self-administered, and questionnaire-based study. It was conducted in the rural tertiary care hospital of MGIMS. Material and Methods: 166 medical students were assessed for the quality of sleep in relation to their personality traits using the Pittsburgh Sleep Quality Index (PSQI) and Eysenck Personality Questionnaire-Revised Short Scale for sleep quality and personality traits, respectively. Statistical Analysis: Quantitative and qualitative data for socio-demographic and clinical variables were analysed using SPSS 20.0 version. Results: Among 166 medical students, 54 (32.53%) reported poor sleep quality. Students with poor sleep quality had higher scores on neuroticism (6.24 ± 3.08) than those with good sleep quality (4.23 ± 2.52,P< 0.001). Neuroticism was positively correlated with the global score on the PSQI (r = 0.39,P< 0.001), whereas extraversion was negatively correlated with the global score (r = −0.16,P< 0.05) on PSQI. Conclusions: The study shows that neuroticism and extraversion personality traits are associated with poor sleep quality among medical students. The effect of sleep quality with academic performance may be explored by comparing these personality traits in future studies. Introduction: Safe blood is defined as blood from voluntary and non- remunerated blood donors.1 Today, 6.22 million units (73%) of the 8.5 million units required in India annually, are from relative and professional donors who under pressure, can hide their high-risk status, including diseases in window period., Unawareness, misconceptions and myths act as hindering factors in voluntary blood donation., This pilot research project was carried out to explore knowledge, attitudes and practices (KAP) of hospital visitors towards blood donation in central India. Objectives: The objectives of this study were: 1. To know the motivating factors and misconceptions regarding blood donation in a selective population i.e., the hospital visitors. 2. To examine the basis of their decisions regarding participation in blood donation activities in the hospital and community. 3. To develop basic data for large population based survey of the region, for the same. Settings and Design: This was a case control pilot study carried out at Kasturba Hospital Sevagram, a rural tertiary care center of central India. Methodology: For this study 100 hospital visitors were recruited, of which 50 had donated blood in their life (consecutive donor cases) and 50 were non-donors (Age, gender and education matched controls). A questionnaire was developed by taking partial help of previous studies in Asia region4-6 and it was validated for our needs, by testing it on medical colleagues and then on random hospital visitors. A written interview was done with all the participants to assess their KAP. Statistical Analysis: SPSS 15 and Microsoft excel software were used to compare KAP of two sets of study population by using univariate and multivariate analytical tools mainly percentages. Evaluation of P value was also done by Fisher exact test/Chi square test/Phi value/Z test where ever appropriate. Results: The majority of participants were in age group of 20-29 years (44%) and only 2% participants were females. A total of 72% had attained education up to intermediate level and above that. Both of the populations had good knowledge regarding qualities of blood donors, process of donation and attributes of stored blood units, like required body weight, age limit, amount of blood drawn, shelf-life of blood and also some causes of donor deferral. But there was a general lack of awareness regarding minimum hemoglobin level required, types and uses of blood products, screening tests done after collection of blood. While donors had better knowledge of duration of donation process, non-donors had better knowledge of transmission of various infectious diseases through blood transfusion. Although, positive attitudes were found in both groups, however both groups believed that patients' relatives should be asked first, for blood donation. 62% donors donated blood only once, which too in relative-donor category, however there was a significant difference in both populations on willingness to donate. The most effective motivational factor for repeated blood donation was found to be possibility of future need of blood for oneself and own family; others being inspiration by television and friends, or a blood bank/hospital campaign. The most common reason for not donating blood was nobody approached them to realize the need of blood donation. Conclusions: Good knowledge and positive attitudes in both the study-populations are unable to motivate for actual blood donation. Use of social and mass media, creating donation opportunities and removing wrong beliefs in general population emerged out as workable strategies for increasing voluntary blood donation. Implication: Report of this pilot project will be helpful in designing a more elaborate survey of general population and thus a more efficient and targeted motivational campaign for voluntary blood donation.